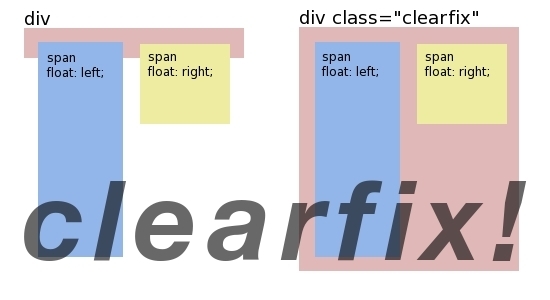 Recently I was looking through some website's code, and saw that every <div> had a class clearfix. After a quick Google search, I learned that it is for IE6 sometimes, but what actually is a clearfix? Could you provide some examples of a layout with a clearfix, compared to a layout without a clearfix? If you don't need to support IE9 or lower, you can use flexbox freely, and don't need to use floated layouts. It's worth noting that today, the use of floated elements for layout is getting more and more discouraged with the use of better alternatives. Flexbox is supported from Firefox 18, Chrome 21, Opera 12.10, and Internet Explorer 10, Safari 6.1 (including Mobile Safari) and Android's default browser 4.4. For a detailed browser list see: http://caniuse.com/flexbox. A clearfix is a way for an element to automatically clear its child elements, so that you don't need to add additional markup. It's generally used in float layouts where elements are floated to be stacked horizontally. If you learn by visualizing, this picture might help you understand what clearfix does. The other answers are correct. But I want to add that it is a relic of the time when people were first learning CSS, and abused float to do all their layout. float is meant to do stuff like float images next to long runs of text, but lots of people used it as their primary layout mechanism. Since it wasn't really meant for that, you need hacks like "clearfix" to make it work. These days display: inline-block is a solid alternative (except for IE6 and IE7), although more modern browsers are coming with even more useful layout mechanisms under names like flexbox, grid layout, etc. The clearfix allows a container to wrap its floated children. Without a clearfix or equivalent styling, a container does not wrap around its floated children and collapses, just as if its floated children were positioned absolutely. There are several versions of the clearfix, with Nicolas Gallagher and Thierry Koblentz as key authors. To offer an update on the situation on Q2 of 2017. A new CSS3 display property is available in Firefox 53, Chrome 58 and Opera 45. The element (with a display property set to flow-root) generates a block container box, and lays out its contents using flow layout. It always establishes a new block formatting context for its contents. Meaning that if you use a parent div containing one or several floating children, this property is going to ensure the parent encloses all of its children. Without any need for a clearfix hack. On any children, nor even a last dummy element (if you were using the clearfix variant with :before on the last children). This container box encloses all of its floating children. Simply put, clearfix is a hack. It is one of those ugly things that we all just have to live with as it is really the only reasonable way of ensuring floated child elements don't overflow their parents. There are other layout schemes out there but floating is too commonplace in web design/development today to ignore the value of the clearfix hack. The purpose of these combined behaviors is to create a container :after the active element containing a single '.' marked as hidden which will clear all preexisting floats and effectively reset the the page for the next piece of content. Of course this can only be used in instances where you never wish the content to overflow. Not the answer you're looking for? Browse other questions tagged html css layout cross-browser clearfix or ask your own question. What does the clearfix class do in css? How to properly clear these floated divs? How can I move my content below some floated divs? How can I automatically fill margin for remainder space? How can I keep an element under a floated one? Why is all content on my home page overflowing the body border? What methods of ‘clearfix’ can I use?